I really loved sharing my daughter's party with you last week. Your feedback meant a lot to me. I was aware of how "unflashy" it was in this day and age of fancy parties and the blogs that go with them. I wondered how our humble affair would be perceived. So many of you appreciated the low budget aspect of all of each detail, and recognized that fun doesn't need to be bought. When you focus on making less waste and more handmade, you become intimately connected to your choices and intentions... the bonus: it often doesn't take a chunk out of your wallet. I'm thrilled that you appreciate that, too. What a wonderful community this is! Before the party, I had been sharing my mother's relocated sewing corner... and how she had to make room for her new upstairs bathroom. So today let's talk about that bathroom. 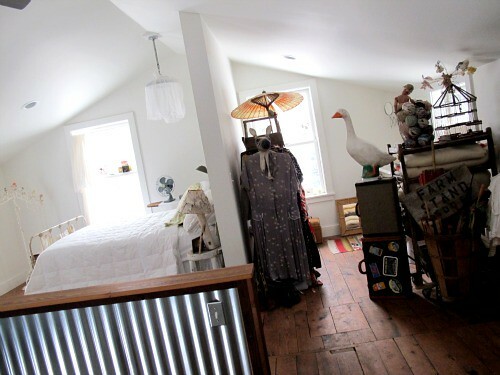 A little reminder: the barn's upstairs is one large room. The studio and bedroom are divided by a stairwell. The bed and bath share a common wall, but there are no doors... and no closets for that matter. We've played with impromptu privacy screens before. Here is the latest(and wildest) iteration. 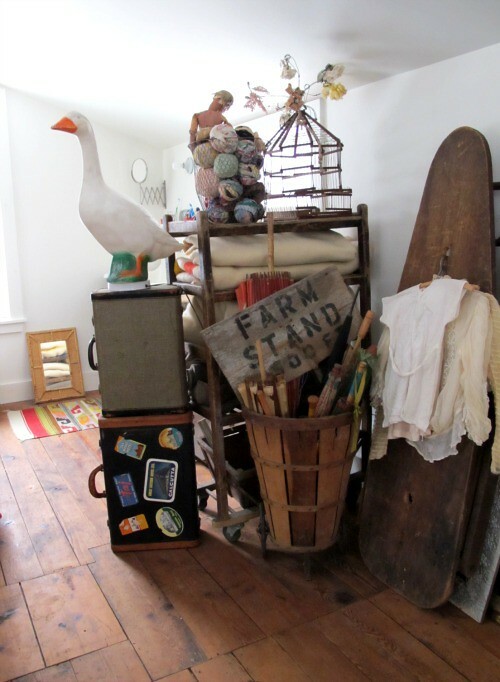 Suitcases, a birdcage, rag balls, a goose... oh my! Her dream sink for upstairs needed to be able to play double duty as "master bath" (insert giggle) and an art studio utility sink. My mother waited until just the right one showed up at Significant Elements, our local salvage store. It obviously had a busy former life, and we love that. She had come close putting in an IKEA sink found at a garage sale this summer. Not only was it too small, but it didn't seem to have anything remarkable about it. Nothing wrong with that, but she/we prefer a little history if possible. Now, this sink has SOUL! The new galvanized pipe legs were intentionally left exposed to let the sink's whole story be visible. The "where do we hang a hand towel" conundrum was solved when my mother tied a length of sturdy rope across the pipes. A great reminder that this fabulous and funky little space is not so "precious"... it is also a place of work- the studio washroom! Function meets whimsy... that's my mother! Well, friends thanks for another visit! Hope your week is off to a great start... and please stay healthy. The deep winter cold & flu bugs are out in full force and knocking on every door. Oh! I do love a good sink! My kitchen sink is original to our 80 year old home. Nothing fancy, but super special! Also- wanted to add that I feel you on the bday thing. We had my daughter's party saturday and I'm slowly posting pictures. I love celebrating the fact that bdays can be small and wonderful! Oh, I wasn't thinking it was unflashy! I was thinking it was wonderful and I wish I had time to put something like that together for my 6yo last year, but with his younger sister being only one, not so much! So we went to a local nature center and the kids got muddy and went ponding and it was pretty awesome anyway. He's been invited to one of those parties at a "fun" place that makes you sign a liability waiver and serves questionable food that he can't eat anyway. I'm sort of dreading it. Such a fun look at such a fun space. Thanks so much for sharing! I've actually been thinking a lot lately about my shift in thinking where household items are concerned. A few months ago we got rid of (gave it back to the family we were borrowing it from) a very large dresser we had been using. And my initial thought was, "We need to buy a new dresser!" But as my husband and I brainstormed we decided to go with an idea he had been wanting to try for a while: put our folded clothes on the shelves in our back closet. And you know what? I couldn't be happier. It makes me never want to go back to having a dresser again. No more clothes stuffed into the bottom of drawers. No more bulky furniture in the way (especially in our little apartment). Now I can see everything at once and make clothing choices quickly. I've been trying to be more conscious of decisions like that in our home lately, and I most certainly feel more satisfied with my surroundings. 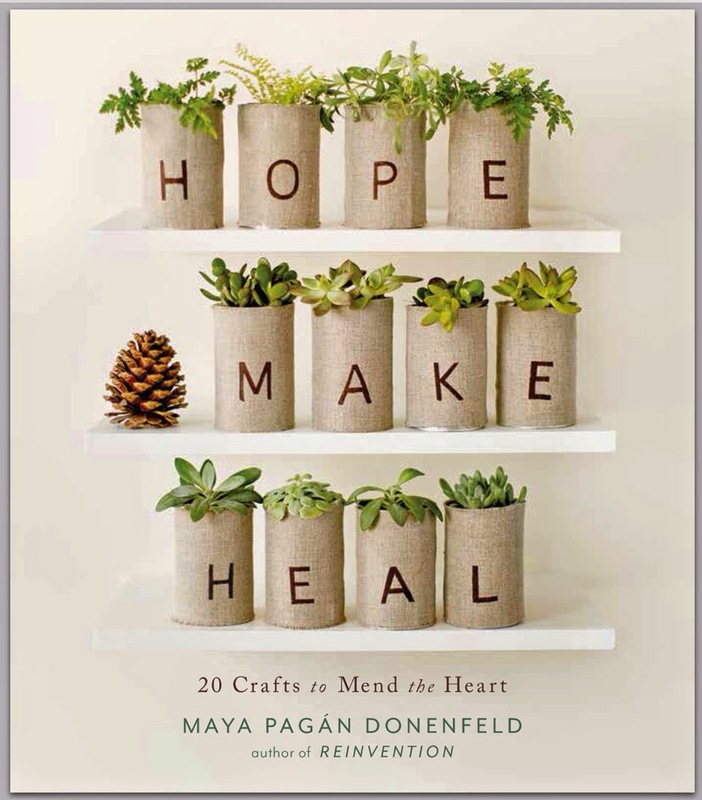 I think we get so bombarded with the message that "this is what everyone has and you must need it too," but I think mass-produced items rarely fit into our lives as well as handmade or handpicked items do. Thanks so much for your reminder of that here and in your posts about your daughter's birthday party. I loved looking through those posts. Definitely more my style than registered trademark princesses. I'm always inspired by your blog. It's such a beautiful, calm place to be. Thanks so much for all you share. Uhh... and sorry for the longest comment ever. This just really spoke to me. mandi- b-days can be small and wonderful... perfectly put. Amy- when my son's little sister was one we "went" somewhere for his b-day, too: our local science center. You have to do what works at each phase in mothering, don't you think? I do. We've attended two parties at the bounce house type place where you sign a waiver (ugh). I'm sure your son will have fun, regardless of your dread:)Good luck! I LOVED your lengthy comment... more like a conversation when this happens. From registered trademark princess to the unwanted messages about purchasing mass produced furniture... I'm with you. It's so nice to hear your story about your closet. My husband doesn't have a dresser either... just a closet. There is a hanging cloth shelf (made for sweaters) that adds to the organization. We considered a dresser for years, because we thought "doesn't everyone need one"? He really doesn't. Which is great... because I need TWO for all my stuff:) Here's to feeling "satisfied in our surroundings"! Corrine- that goose has a very nice story, too. Someday, I'll share. katy- I'd love to see photos... I know you find a way. Oh my gosh, that sink is beautiful. I can't wait to own my own home someday so I can put the time and effort into making it just how I want. Rentals seem so uniform to me, even after you hang and install all your beautiful items, the walls, carpet, and appliances are still bland. I also love her bed frame. I always thought ones like that were so simple and in their own way elegant. Could you hear my cries of envy all of the way from Minnesota? First a barn for a home (my dream), and now the coolest sink ever! Oh please, the pain is excruciating! However, I am very happy for your mom to have such a cool space. Now, anyone have any advice on how I can "country up" my home? I have a ranch house, 1200 square feet, definitely is a Home, not just a house, but I am wanting a change. Maybe an old farm sink of my own in the kitchen. Hmm. Oh, how perfect! That's just the kind of sink our farmhouse kitchen needs. Someday. I love the sink! I also like that it looks like it has a loincloth. So appropriate in a bathroom! I really do want to come and explore your mother's house. 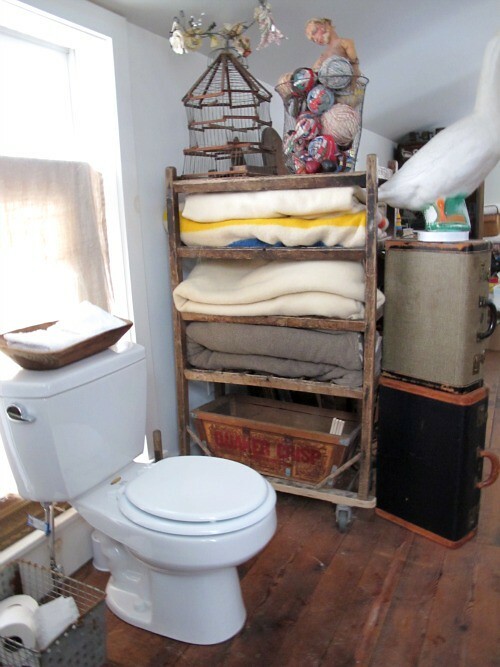 It seems to be full of treasures, even the bathroom! While I loved my mother dearly, she was not nearly as creative as your own mother. I love it so much! Every detail you share about that barn just amazes me! I can only imagine her house! Very cute bathroom. 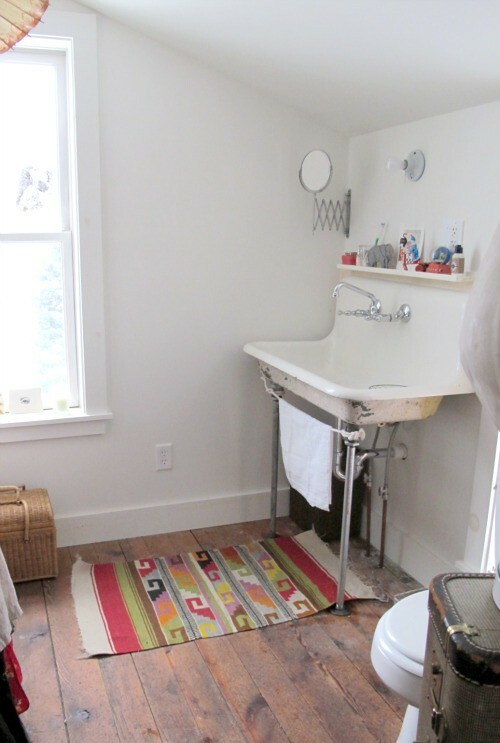 I love that the divider is useful storage, and the antique sink is perfect for a farmhouse/barn. I just love the sink. In fact there are a couple very similar at the local Habitat ReStore and I'm tempted in picking up one for the guest bathroom. 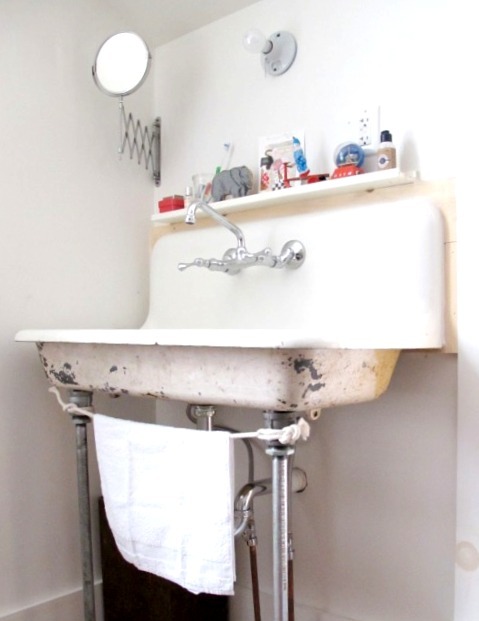 I remember growing up with this style of sink in several places we lived. How I would love to have a barn in the field. The wood floor is awesome. My next project is to replace the vinyl and carpet in my house with pine flooring, I like primitive/rustic and that's the first thing I look at when drooling over the photos of your Mom's barn. Thanks for the inspirations. 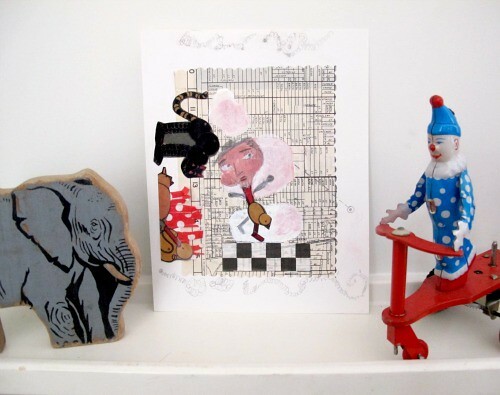 I already have that little blue clown guy and a love for vintae industrial sinks. Its charming, homey. 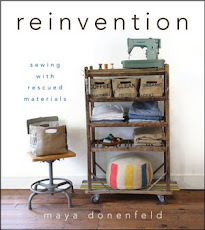 "When you focus on making less waste and more handmade, you become intimately connected to your choices and intentions"
soo true. I have this weird experience of feeling "richer" the more intentionally I spend (less) money, make more handmade. I much prefer that type of birthday party. The few that we've held have often been just a bunch of kids running around the park and all we did was serve food. The kids didn't seem to care. I remember some of my favourite parties when I was a kid were the ones where my parents piled loads of kids into the car (ah, the days before seat belts and car seats...) and went up the hill to play games like cricket and hide and seek.